To download podcast from iTunes: Click here. Man, I really hate blogs. While I think it's great that just anyone can now have a relatively anonymous outlet for their random thoughts, it doesn't necessarily mean that those thoughts deserve an outlet. For example, the blog maintained by a friend of a friend recently spent six paragraphs bemoaning people who use the word orientated instead of oriented. The entry following that is a minute by minute breakdown of the MTV Video Music Awards. After reading through most of these entries, I couldn't help thinking..... Who gives a crap? Because of this blogs, and many, many others like it, I think that by and large, blogs are unnecessary. And just so we're clear, this blog is no different. It's just as unnecessary. I'm positive that absolutely no one cares about my musings about pro basketball. 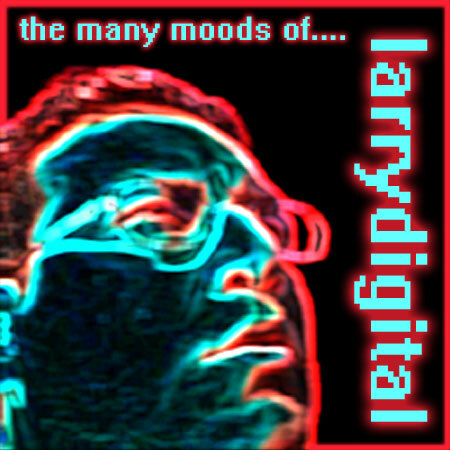 While I agree that this blog is boring as anyone else's, I like to think that what separates it from other blogs is that this one was originally conceived as a music blog that would primarily promote my podcast, the many moods of larrydigital (also available from the iTunes store!). This blog has a purpose, the Hot Mexican Love Comics blog has a purpose, the upcoming Oliver J. Pugsworth Academy of Design blog has a purpose (details coming soon). That makes them different right? ........Not really. They're all equally useless. So you can still expect entries on subjects that mean absolutely nothing to anyone. Yay! Anyway, you may have noticed a slight stylistic change in this site. Namely, the new graphic at the top of the page. If you look closely, you'll notice that it contains the names of various bands and artists, many of which are favorites of mine. All of which have either been included in my podcast already or will be included in a future episode. Wow. I really took the long way around to comment on my lame new banner, didn't I? On to the podcast, this episode is sort of a mini-tribute to Isaac Hayes. The first part being my choice of background music, "Hung Up On My Baby" from his soundtrack to the 1974 blaxploitation film Tough Guys. This song was famously sampled by the Geto Boys for their 1991 breakthrough hit "Mind Playin' Tricks On Me." Here's a quick larrydigital fun fact: the CD single for "Mind Playin' Tricks On Me" was the first CD I ever owned. The second? Color Me Badd. The second part of the mini-tribute is the inclusion of Isaac's nine minute song "Hyperbolicsyllabicsequedalymistic" from 1969's Hot Buttered Soul. This is the second song from Hot Buttered Soul that I played in the many moods of larrydigital. Considering there was only four songs on that album, playing two of them seems kind of funny to me. 16. "Bamboo Banga" by M.I.A. This month's theme song is "Hung Up On My Baby" by Isaac Hayes. I'm not going to go too in depth about how Isaac Hayes was one of my favorite singers or anything (even though he was) because there's already dozens of epitaphs out there already and I'm sure that most of them are much better than anything I could write. I'll just simply say that I was deeply saddened to hear that he had died. I think it's a shame that he's more famous today as being the voice of Chef from South Park rather than the guy who co-wrote Sam & Dave's "Soul Man." Or as the guy who released the phenomenal Hot Buttered Soul album in 1969. Or as the first African American to receive an Oscar for non-acting work (Best Original Song in 1971 for "Theme From Shaft"). But it's a better legacy than most I guess. It's fitting I suppose considering that Isaac last #1 single was his song "Chocolate Salty Balls," which he recorded as Chef for the Chef Aid soundtrack from South Park in 1995. Why can I say? The world just got a little less funky, people.